Ira Sluyterman van Langeweyde, or as the internet knows her, Iraville, is the star of this month’s box! With over 800k followers on Instagram, she’s (dare we say), a pretty big deal. Her style is distinctive, full of personality and fills us with a warm cosy feeling. 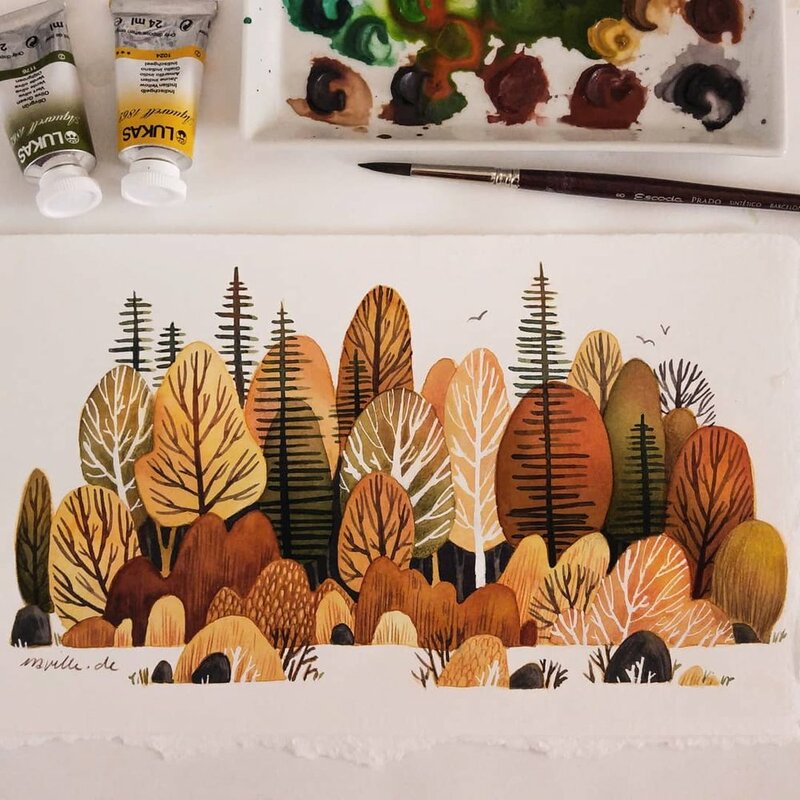 Ira discusses her creative beginnings, selected colour palettes and her exciting new book below! Let’s start off with your artist background! How did you get into illustrating these wonderful characters and scenic landscapes? Did you go to art school or is this something that organically developed? Thanks, I'm glad that you like them! Well, both. The thing is, it’s a little bit complicated. I went to university, studied design and wanted to become an illustrator. But early on during my studies, I was a little bit intimidated by others. I thought that the other students had much more talent than me; however I was to learn that talent can be grown. Because of my initial lack of confidence, instead of drawing more to become skilled, I gave up my dream of becoming an illustrator. Nonetheless, I still got my diploma as a designer and I worked for several years in the field, first for an agency, later as a freelancer. I made some illustrations from time to time, but mainly to decorate websites I was designing. They didn't look too good, sometimes I just copied photographs. About six years ago, when I planned a new website design for a client, I wanted to include ink that was spreading over paper for the background of the site. In this moment something magical happened: I loved watching the ink spread over the white paper so much, that I began drawing with ink just for myself. I bought myself a sketchbook and some watercolours, and I then started experimenting with different techniques, all just for my own joy. It made me so happy that I couldn’t stop which is how I rediscovered my passion. When it comes to your work, the Ira style is so distinctive! 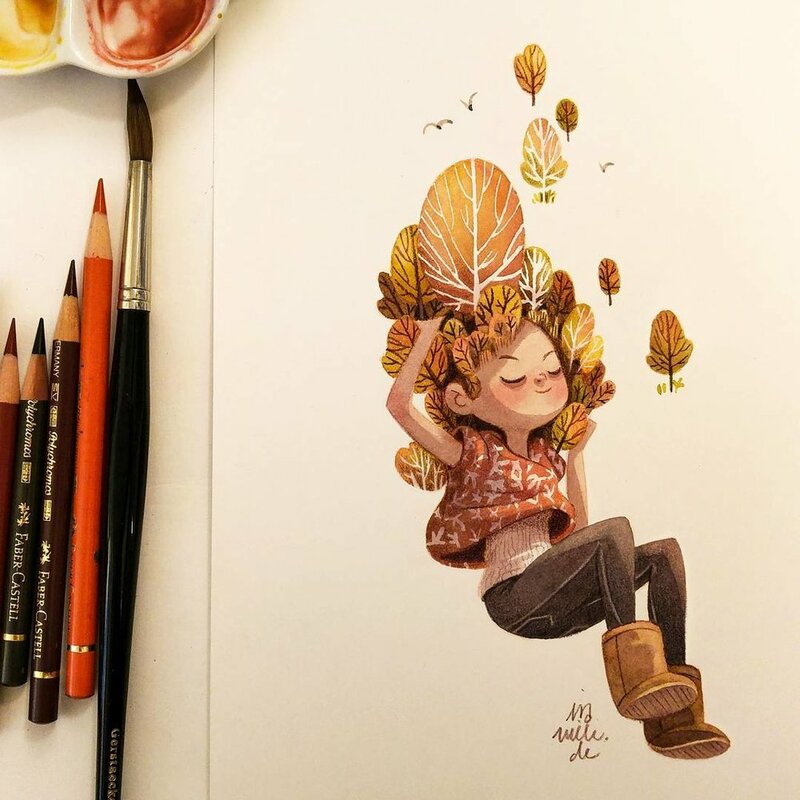 What helped you discover your natural colour palette and what inspires you to keep on drawing nature and cute characters? I experimented a lot like I said. 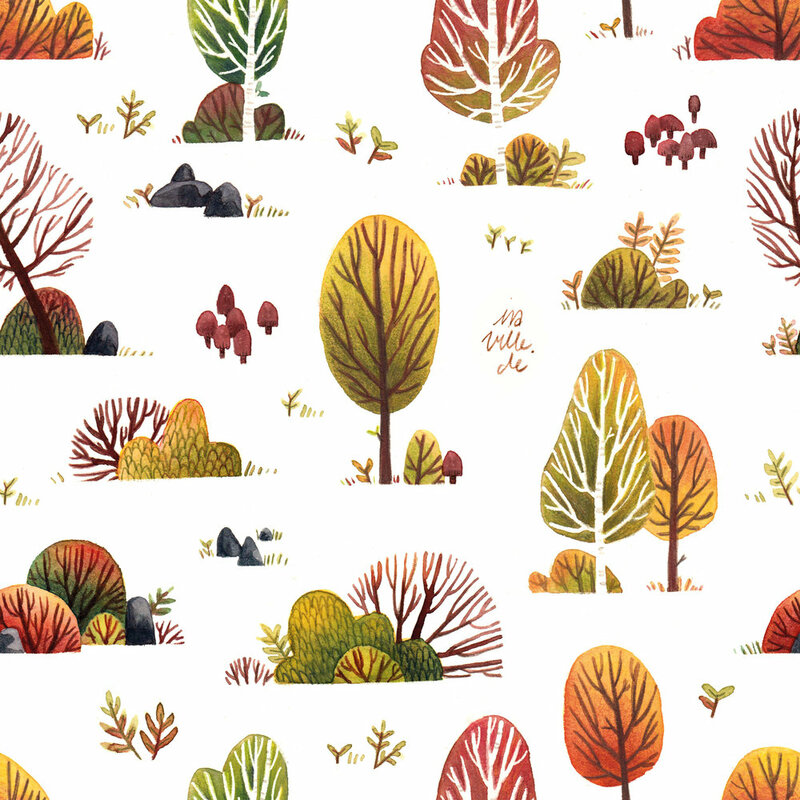 I discovered that I love earthy, warm colours; I'm always trying to make my illustrations not too vibrant or too colourful. I use very few colours for one piece which I mix so that they work well together. The motifs are just things I love. However when I create works for clients, it might be a little bit different of course. The lovely thing is that nowadays most of my clients will approach me because they like my style. As I live in a big city; nature is something that I miss from time to time. As for the little cute characters, they are just fun to paint. I like to paint cute or beautiful things because it's very calming for me. The process itself is the most important part in my opinion, as when I paint I am the happiest. On the topic of characters - your drawings are so full of personality! Do you take references from people you see out and about or seek out quirky faces on social media? Thank you, it's great that you mentioned that they are full of personality because that's one thing I am always trying to achieve. They should look like real, living people, even if they are drawn in a non-realistic style. I used to use some references from the internet in the past, but mainly for poses, not for the facial expressions. Today I rarely use references as sometimes when I want to achieve a certain facial expression; I will just look at myself in a mirror. Most of my characters come straight out of my imagination. I just doodle in my sketchbook and from time to time, when I like a character that I’ve sketched, I use it as a preliminary drawing for a watercolour illustration. Where does your love of the autumn season come from? Hmm, I'm not too sure. It's just that I like the cosy atmosphere. You know ... the times when you are sitting at home, drinking tea or coffee, reading a book or looking out of the window when it's rainy. Or you have a walk outside during which you see the falling leaves with their beautiful colours. It's not too cold like in winter, but it’s not too hot like it can be in summer. It's just my favourite season! We love the cosyness of the autumn season too! Do you have a material that you would LOVE to work with, yet you are scared to try out?! No, not really. Well, I'm not a sculptor who works with, let's say, a chainsaw and wood. However if you mean whether or not I'm afraid to try out new materials and techniques; absolutely not. I like trying new things. I'm not afraid of making mistakes. I think it's good to make these mistakes, because that's part of the process and a good way of learning something. We have seen so many lovely posts about your new Kickstarter book - “Cozy Days”, could you tell us more about this art book! The books full name is: "Cozy days - the Art of Iraville". It will be a beautiful book that contains all of my best images up until now and it will also contain un-seen illustrations that I have never shared. The publisher, 3Dtotal, reached out to me with the idea. I had thought about producing a book before as a lot of people had asked me about a publication featuring my work. I think that my paintings look far better on paper than on-screen because that's the way I create them - on paper with traditional techniques. I'm involved in every aspect of the book, so I can make it 100% perfect. It will contain behind-the-scenes material, an insight into my work and my thought, a painting tutorial, as well as some do-it-yourself chapters. I will explain how you can easily make your own watercolours out of pigments, or how you can bind your own sketchbook. The book will also contain beautiful photos, and it will have a nice layout. You mentioned the Kickstarter campaign for the book ... I was overwhelmed how many people took part and helped me to make it happen! The book will be available in November, but you can already preorder it at shop.3dtotal.com and it will be shipped worldwide. 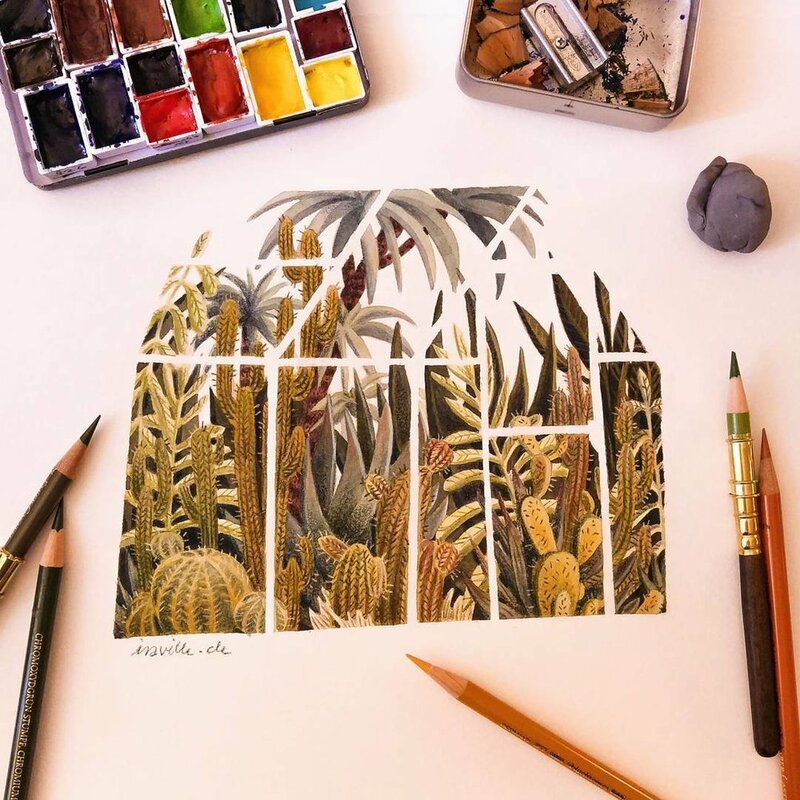 Ira shares her top 3 tips when it comes to illustration! Don't measure or compare your work with other peoples. Your work should be distinctive. Experiment and find new ways of expressing yourself or drawing things. Don't try to paint like everyone else, do it your own way. Don't be afraid of mistakes and be patient. You cannot skip steps; you need them to gain experience. Want some stationery featuring artwork by the talented Iraville? Subscribe to Ira's Papergang Box! For £10.95 you will receive a box full of stationery goodness delivered straight to your door, (it's super pretty too!). Click here or the big button below to head over to papergang.com.